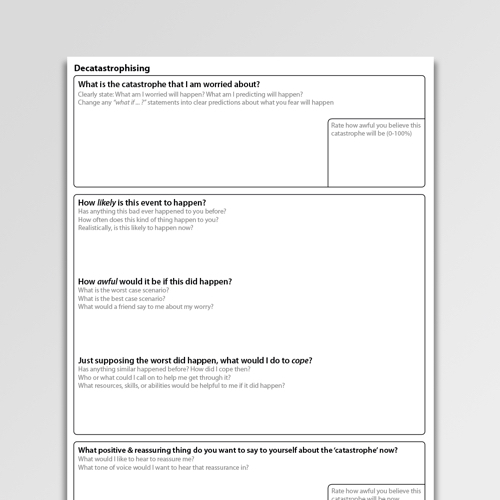 Decatastrophizing is a cognitive restructuring technique to reduce or challenge the catastrophic thinking (magnification) that is an unhelpful thinking style common to many anxiety disorders. The term ‘decatastrophizing’ was coined by Albert Ellis who developed rational emotive behavior therapy (REBT) but is commonly used within CBT. 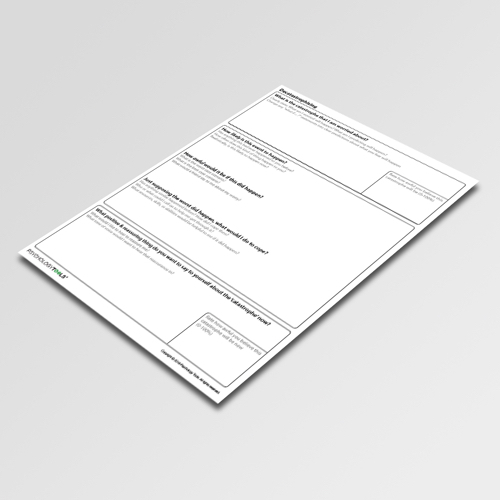 This worksheet can be used to guide a client through this decatastrophizing process and promote the elaboration of balanced responses. The Decatastrophizing worksheet is taken from the book Psychology Tools For Overcoming Panic. Decatastrophizing is a cognitive restructuring technique to reduce or challenge catastrophic thinking. The term ‘decatastrophizing’ was coined by Albert Ellis who developed REBT, but as a technique it is equally at home within a CBT model. Decatastrophizing means addressing these distortions. Questions to ask might include: “Realistically, what is the worst that could happen?” and “How would I cope if the worst did happen?”. 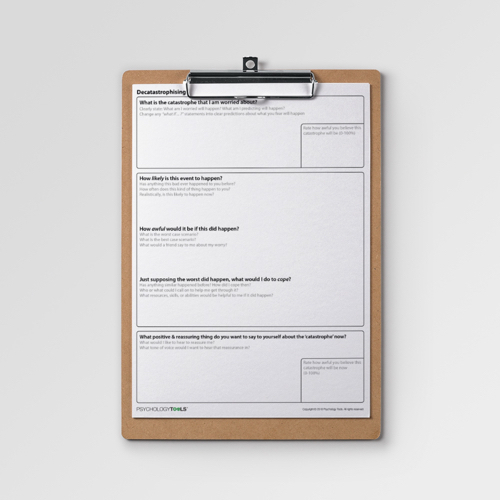 This worksheet can be used to guide a client through this decatastrophizing process. In time clients can be guided to lead themselves through this process in anxiety-provoking situations.